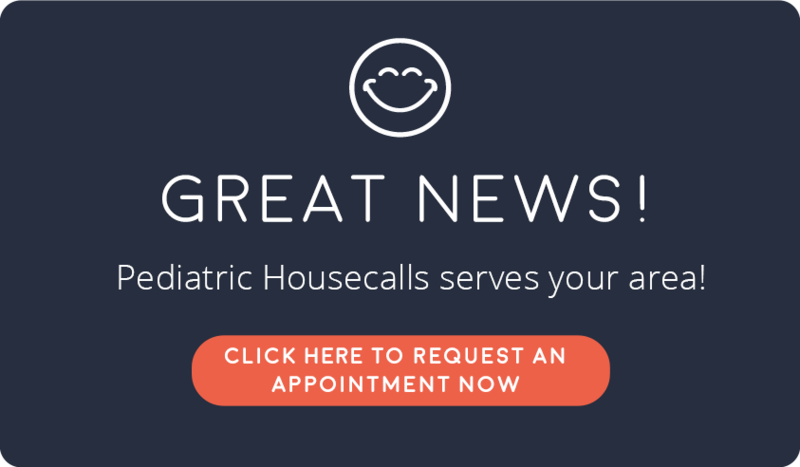 Pediatric Housecalls | Fast. Convenient. Private. ****Update September 2018 - Families with UMR or Meritain health insurance please see updated information about your plan on our Pricing page. Once you request an appointment online or via text, you will receive an email confirmation. Prior to the appointment time, your provider will contact you directly. Our provider will arrive at your home at an agreed-upon time and will examine, diagnose, treat, and prescribe any necessary medications for your child's illness. Text child’s name, symptoms, and your zipcode to 704-992-7337 (PEDS). Our live text scheduler will reply back with all of the available appointment times in their area for that day. Finally, text back which time you would like and the provider will arrive! No more waiting in germ-filled waiting rooms. No more rearrranging of schedules to make it to the office or urgent care on time. No more frantic calls for sitters for siblings. No more dragging a sick, tired, miserable child out of the house. Sound good? We think so too. Life just got a little easier. Pediatric Housecalls is committed to providing the best care for your child with compassion, expertise, and convenience. Meet the team! Board-certified pediatrician with 17 years of experience. Founder and owner of Pediatric Housecalls. Cortney Danner is a board-certified pediatric nurse practitioner and native of Charlotte. Melissa Jesse is a board-certified pediatric nurse practitioner with over 17 years of experience in the field. Savannah Lape is a board-certified Pediatric Nurse Practioner. Since completing her MSN degree, Elizabeth has worked exclusively with children, providing primary care to pediatric populations. Beth Dove is a registered nurse with over 28 years of pediatric experience including triage and management. Camille Glidden is a board-certified Pediatric Nurse Practitioner. Ryan O’Leary is a board-certified pediatrician. She is a member of the American Academy of Pediatrics. Enter zip code to see if Pediatric Housecalls home visits are available in your area!